The Department of Mathematics announces the sponsorship of postdoctoral research by Capital Fund Management (CFM). We are happy to announce that Jill Pipher, who received her BA, MA and PhD degrees from the Department and who is now Vice President for Research and Elisha Benjamin Andrews Professor of Mathematics at Brown University, has just been elected President of the American Mathematical Society. Congratulations, Jill! According to Google Scholar Citations public profile, Professor Stan Osher has been cited a total of 100,231 times since 1989. Applied math PhD student Baichuan Yuan (UCLA) and teammates Jiaping Zhang (UCD), Michael Huang (USC) and Bradley Rava (USC) took home the first place prize of $25,000 at Correlation One's Datathon in partnership with Citadel. 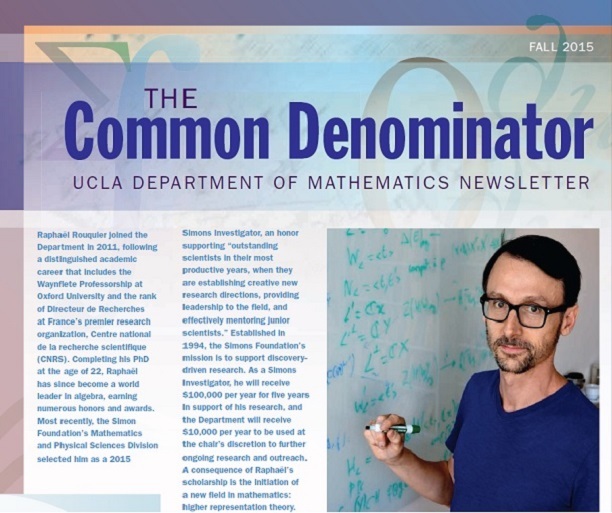 The fall 2017 issue of The Common Denominator is now available to download here.